Veteran trade unionist and CPI(M) Polit Bureau member Madhukar Kashinath Pandhe died of cardiac arrest at a hospital here in the wee hours today. The 86-year old Pandhe was rushed to the Ram Manohar Lohia Hospital last evening after he complained of chest pain. He died at 12:30 a.m.
Pandhe is survived by wife Pramila, herself a veteran leader of the CPI(M), and a son. Expressing grief over his demise, the party Politburo described him as the senior-most leader of the trade union movement in the country whose seven decades of public life began as a student activist. He later rose to become “one of the outstanding leaders of the working class movement of India“. Born on July 11, 1925 at Pune, he joined the Communist Party in 1943. He completed his post-graduation from Pune University from where he earned a doctorate from the Gokhale Institute of Politics and Economics. Pandhe, who was the Secretary of the Sholapur City Committee of the CPI, later took an active part in the Goa liberation struggle. His singular contribution was to the trade union movement as a Secretary of the AITUC in the 1960s and then as one of the key leaders of the CITU of which he became the General Secretary from 1990 to 1999 and then its President till 2010. When the Communist Party split in 1964, Pandhe took a “firm stand against revisionism” and joined the CPI(M). During his revolutionary life he spent four years and six months underground. Associated with all the major working class struggles in the country in the last three decades, Pandhe played a key role in bringing about the unity of the central trade unions. 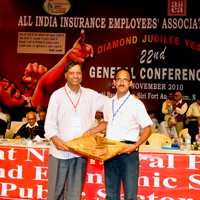 He commanded respect in all trade union circles and was a leader who was most accessible to any ordinary worker. He lived a life of utmost simplicity, the party statement said. He was “a true internationalist” and a firm believer in anti-imperialism who worked constantly for developing the solidarity of the working class movement all over the world. He led a large number of national-level unions, including the All India Coal Workers Federation, International Energy and Miners Organisation, and was a Member of Joint Committees in steel, coal, BHEL, BEL, Port and Docks, the National Shipping Board and the National Maritime Board. His body will be kept on Sunday morning at the office of the Centre of Indian Trade Unions (CITU), which he headed since 1999, and then the CPI(M) headquarters. The cremation will be at 1500 hours on Sunday.